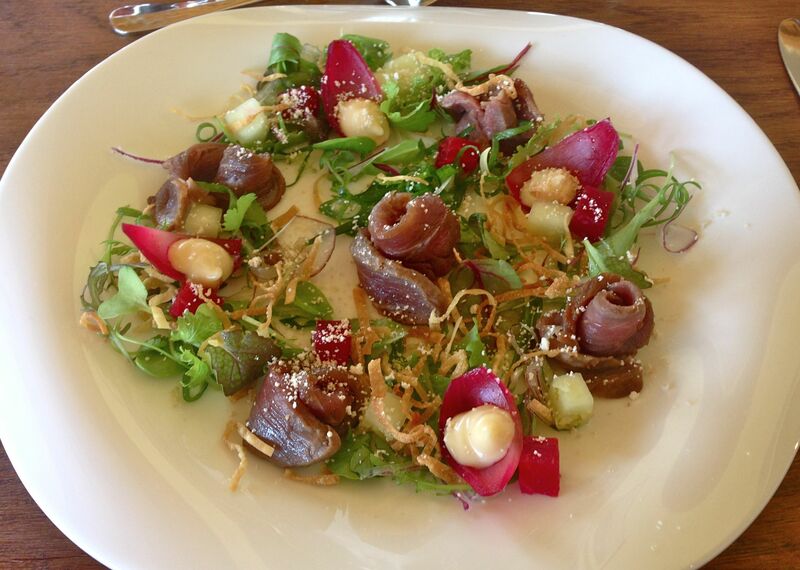 Just 20 minutes from central Cape Town is the De Grendel Wine Estate and its delightful restaurant. Opened in May 2012 it’s become a favourite of mine with its dramatic views back towards Table Mountain and wonderful plates of food. 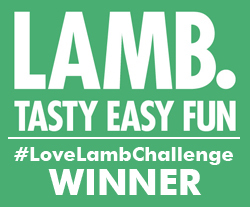 Chef Ian Bergh is a local with classical training and a love of the Cape and its abundance of ingredients which he uses in his glass-walled kitchen. I can’t resist peeking in to see what foodie delights are being hatched. 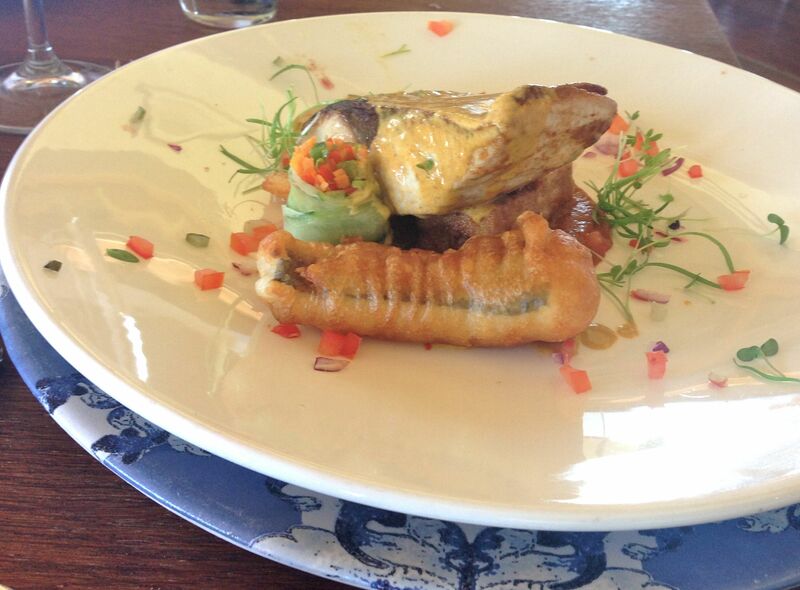 The menu is kept simple with four starters and four main courses to choose from. Service is friendly and knowledgeable, our waitress described dishes in such tasty detail it made the table ‘yum’ with anticipation. A colourfully tasty plate of smoked beef with coriander, onion, herbs, wonton, gorgonzola and smoked goats cheese made the perfect light starter. I’m partial to a bit of smoked beef with its delicate flavour and texture and it’s not something I often see on menus. 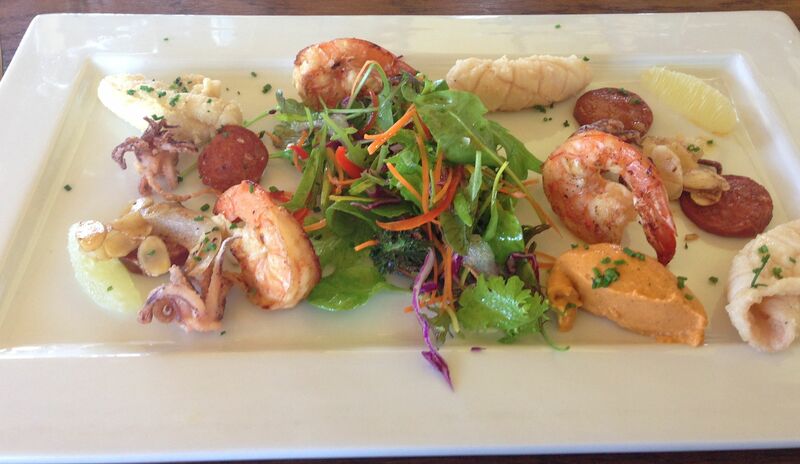 Seafood delights with this squid, prawn, tomato panna cotta, cabbage, spring onion, chorizo and cucumber starters. The pan-fried prawns were plump and juicy and the squid was dipped in flour and fried to produce a flavoursome, tender morsel. 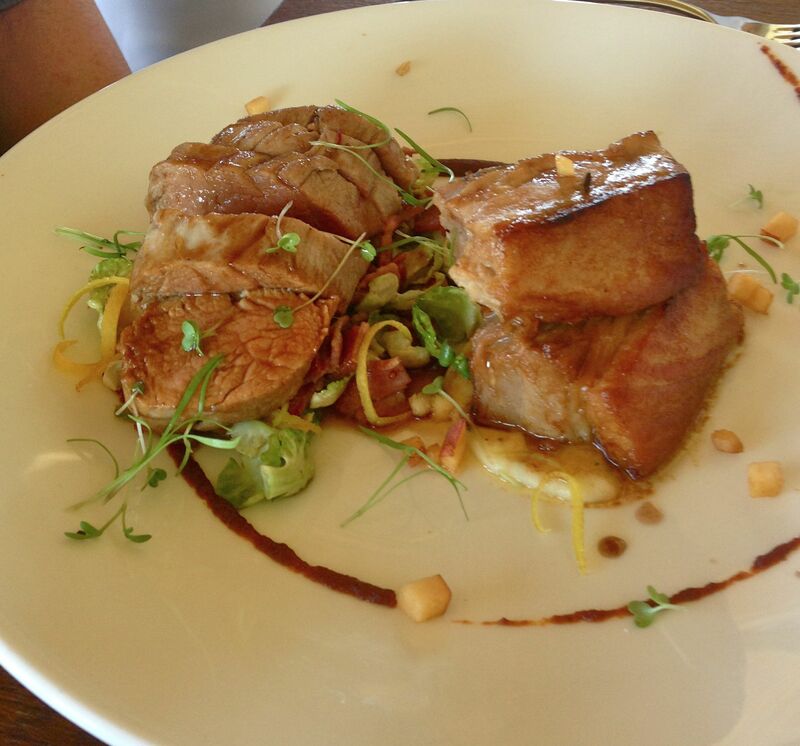 People always rave about the pork dishes at De Grendel and today was no exception with this substantial portion. Pork belly, fillet, brussel sprouts, sundried tomato, bacon, port and orange. The fillet was so perfectly soft there was barely any chewing involved. Today’s linefish was, once again, yellowtail. Served with red pepper, cucumber, mange tout and smoked tomato vierge, the description on the menu didn’t really do the dish justice. It also included a delicate piece of battered hake on the side and the most amazing chick pea tart/mousse kind of thing. Plus the veges were cleverly wrapped up in cucumber sushi-style. We’ve been eating out rather a lot lately (even a lot for me!) – so there was sadly no room for dessert…though the chocolate, chocolate, chocolate option did sound tempting. As well as the great food, service and views, one of the best things about De Grendel is their wine. We drink more than our share of it when we are in Cape Town and love their Rose, Sauvignon Blanc and Pinot Gris. And their restaurant prices are the same as the cost of a bottle in a shop…wish all restaurants did this, what a joy to sup on a bottle of Rose with your meal for R55 (about £3). Oh and here’s the view. 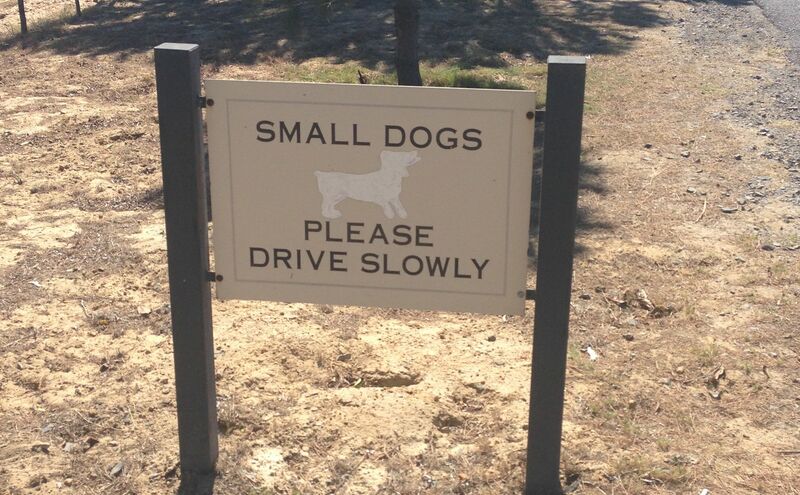 Also love the signs dotted along the road as you approach…driving advice for little canines? De Grendel is just off the N1, a right turn from Plattekloof Road.